I am not a fan of reality shows, in general I find their premise ridiculous. They want you to believe that people are in mortal danger, making important life decisions or having spontaneous heartfelt discussions (or meltdowns) all while under the watchful eye of production and camera crews… what nonsense. I have however made some room in my skepticism for a couple of shows – Shark Tank, which I mentioned previously (on 3-19-12), and our fairly recent discovery: The Pitch. We devoured the eight episodes of season 1 and are looking forward to season two. Each show closely follows two ad agencies as they compete and create their pitch to win the business from a national client. These are some quotes that I have written down during different episodes. Compared to what we do in art licensing this is presentation on steroids, but the principles are the same. Listening to your customer and delivering fresh, workable ideas developed with a client focus – this is the difference between winning and losing. Sometimes you can just see them going wrong. Clarity is the name of the game – a single well developed and clear message generally wins out over a complex multi-faceted one. Ain’t it the truth…let’s watch and learn. We are bouncing around at 39,0000 feet as our plane scoots around some weather after having finished another Licensing Expo in Las Vegas (used to only be the Licensing Show…we’ve been upgraded to Expo now…). We’re happy to leave the desert behind us – get me some humidity, please! All in all, not a bad show but definitely not a record setting event. We had a very good first day, an OK second day and the third – well, we could have slept in and hit the pool instead. It was a bit of a reversal of the usual pattern, traditionally the first morning has been quiet while everyone checked out the spectacular booths offerings of the big exhibitors, but this year it started off with a bang. Overall, traffic did seem to be down although it is always hard to accurately judge from what we see in our little section, and I have not heard any of the official reports yet. (Hmmm, do official attendance numbers ever show a decline?) We had some pretty good meetings from both appointments and walk-bys, and will certainly see results from them, but definitely would have liked more. One problem we have had at this show for the last oh, ten years or so, is that the Art and Design section is usually placed in the worst location possible, and when it appears that may not be the case they will move us just to make sure. Unfortunately art is the small fish in the big licensing pond, and the reality is that the majority of the attendees have no interest in our section. It’s frustrating but all we can do is make the best of it. The art on the floor was good this year, only a couple of obvious clunkers, and I think most of the exhibitors did OK and at least a few had really good shows. 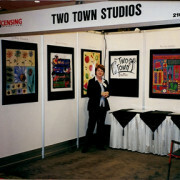 There was a lot of concept and character based work, which is good because that is more appropriate for this venue rather than other shows like Surtex. 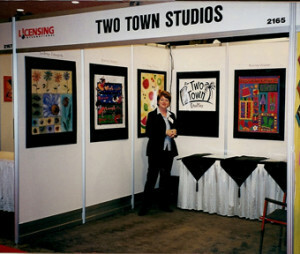 As I have said before, my opinion is that Licensing is not a show for an inexperienced artist, particularly if you are a pattern based surface designer or you work in single designs and associated collections. It’s a show about big ideas. Just one more sign that we are making our way in a new world out there. Surtex was a good show this year, and you likely have heard that by now because it seems to be trumpeted from every platform in the industry. I do not recall seeing this kind of buzz continue this long AFTER a show, and while it was a good one I am not sure that it was in the record setting category. But what the heck – we’ll take it. There has been some interesting back and forth on a couple of forums between newer exhibitors who are excited about the show results and some veterans who are suggesting that the real measure of the show won’t be apparent for months. As far as I’m concerned they are BOTH right, inasmuch as there is a right or wrong to it. It’s becoming generally accepted that it takes 2 or 3 exhibit appearances at Surtex before you can accurately judge your results. I would agree, and also suggest that a vital part of this multi-year “seeding of the market” is the improvement and evolution of both the art and the “art of presenting” that occurs over those years. Art licensing, and particularly exhibiting, is a biz that is best learned experientially – there are skills and an awareness that come from experience and it is difficult to shortcut that. The artists who do well in this business are the ones who understand the need to take the long view and keep showing up with something new – every year, every show – and even if the work doesn’t fly it will continue to build their connection with the customer. Ronnie first exhibited at the Licensing Show back in the mid-90’s (sharing with Cathy Heck), and we first exhibited at Surtex under the Two Town moniker in 2001. 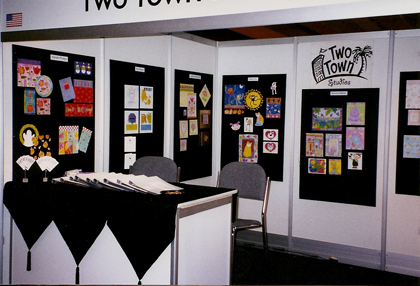 When we look back at pictures of those earlier booths we are not horrified because we did the best with what we knew back then, still managed to do some good business and built upon what we learned from every show. Whenever you build a business (which you are) one of the primary considerations has to be how you are going to acquire customers. This is paramount – no customers, no business. There are any number of theories and methods to accomplish it but basically all revolve around proceeding through the necessary steps: awareness, interest, deliberation of action, purchase, retention. This is a process, not an event, and it goes on for as long as you are in business. No one is exempt from the continuing need to build and nurture these relationships, and believing that you will be able to bypass it just by putting up a booth at a trade show is setting yourself for a disappointment. These shows are a great tool to concentrate a lot of customers in one place for a short time, they are fast paced and exciting but be aware that the excitement (on all sides) will cool rapidly in the weeks that follow. Stay with it, let the process work and just keep building.